A lustrous Raspberry Rhodolite stone lies at the heart of this lavish 14ct Strawberry Gold Le Vian ring. Framed with a halo of Vanilla Diamonds and finished with delectable Chocolate Diamond embellishment on the shoulders, this stunning ring boasts beauty. Matching Band: 9760032. 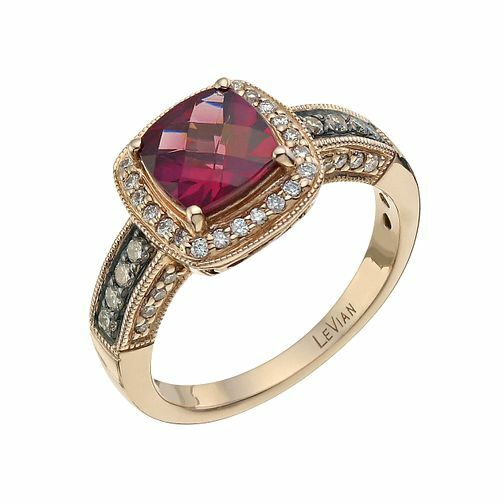 Le Vian 14ct Strawberry Gold 0.33ct diamond & rhodolite ring is rated 4.8 out of 5 by 16. Rated 5 out of 5 by Anonymous from Beautiful Quality ring again from Le Vain. Bought my wife one last year and wanted this one to replace her engagement ring. Replace wedding ring next with Le Vain again. She loves it so yes happy lady. Looks lovely and quality as well, recommend purchase. Rated 5 out of 5 by Anonymous from Stunning ring My husband bought me this ring for my birthday, it's stunning and so sparkly. I love it.